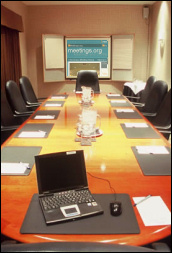 The choice of venue is only one of the costs associated with a meeting. Depending on the nature of the meeting and how many are attending, the venue may or may not be the largest cost. Identify the costs (some possible costs are outlined below). Agree on the importance of each cost. Add a figure for indirect and unexpected costs (they always come up). Agree a maximum spend for each cost. Inform the meeting team of the cost constraints at the beginning of the planning phase. Closely monitor the actual expenses against the planned expenditure and review the differences. Inform those responsible of potential overspending, preferably before it becomes too much. Revise budget to prevent future overspending. Identify reasons for any overspending. Evaluate the cost effectiveness of the meeting. Discuss ways to make the next meeting budget more realistic. Discuss ways to make the next meeting more cost effective. Treasure Hunt and Team Building Events in London - Action Treasure Hunts provide a great way to enhance Staff motivation and team building. Staging Fantastic Treasure hunt and away days throughout the United Kingdom and creating a fun day out for all. Drumculture uses music and a wide variety of arts-based tools for the provision of corporate events and interactive workshops. Whether you are looking for leadership training, a team building event, a conference ice-breaker, a motivational event tool or an innovative way that you can train your teams with corporate social responsibility in mind, contact Drumculture. Hector's Haus - Beautiful boutique dome marquees for hire for very special occasions and impressive events. Team Building and Events UK Orange Tree Events Ltd provide corporate team building, raft building and sailing events in the UK. The company specialises in organising customised corporate events to suit your specification whether it be for staff development, team building, fun days or client entertainment. Operating in the South of England, Orange Tree Events have experience with many different corporate events on land, water and in numerous indoor venues. Club Class Bus is a spectacular Volvo double decker bus which is well cut for event hire and the funky interiors have all the latest features to make your party on wheels a truly exciting experience. From night club music systems to disco lights and large 53 inch flat screens, The Club Class Bus is suited for stag and hen parties, corporate hires or birthday parties. Sandstone provide learning-capable, scalable, inclusive team building activities and corporate away days. Offering activities that are enjoyable and focus on real team improvement, Sandstone can handle any group size from 3 to 3,000 people. There's something for every participant and nothing is compulsory. Sandstone's options can cope with just about any group size in any location nationally or internationally. Indoor and outdoor elements are included to suit the group, the location and the weather on the day! When organising the meeting breaker event, you need to find something stimulating that can be done at the venue. The short budget price team building activities offered by Credit Crunch Events are perfect as they will help keep your costs down but refresh the meeting delegates. London Wedding Toastmaster and Corporate Events Toastmaster - Young and very passionate professional wedding toastmaster and corporate events master of ceremonies, catering for all types of weddings and functions, some of which include Asian weddings, Jewish weddings, English weddings, conferences, awards ceremonies and more. Jonathan Waterman covers Essex, Herts, London, Northants, Buckinghamshire, Bedfordshire, Oxfordshire, Kent, Middlesex, Berkshire, Surrey, Sussex and more. UK Chauffeurs - At UK Chauffeurs, they endeavour anticipate their customer's needs so as to provide the smoothest and most efficient transport options. UK Chauffeurs provide as range of high quality chauffeur services including transfers to and from airports, corporate events, business meetings and appointments, evening hire and the company can even arrange exclusive private jet and helicopter flight services. SeminarMarketing.org - Increase registrations and revenue with our highly effective Seminar Marketing programs. World-class consulting services - marketing, promoting, planning & copywriting for seminars, events, workshops, conferences. Audio Visual Equipment - CMBFast.org provides unbiased listings of companies specialising in audio visual equipment, including sales and hire. Washington Deli is a corporate catering company that offers an office delivery service to the Washington area. Culinary Delight Catering is a Los Angeles based catering company that offers a range of delivery and corporate event services. No Worries Catering is one of the most highly recommended catering companies in the DFW area. The company offers a range of gourmet services for events which can be tailored to fit any budget. Conference Stay is the event, trade show and exhibition search engine, as well as a comprehensive hotel room reserving and business air travel booking service. Designed for conference planners, catering and conference directors, convention organizers, meetings and banquet managers, ConferenceStay.com allows event organisers create attendee itineraries, book hotel rooms at group rates and reserve business flights. Business Meetings Malta will organise your conference, congress, business meeting, product launch, sports tournament or concert in Malta. With our unique expertise in the organisation of business meetings, events, incentives and conferences in Malta, we are offering the finest selection of quality hotels, restaurants and conference facilities. Motivational business speaker John Bell is recognised throughout the world as an authority on people behaviour. John works full-time as an author and a conference, seminar and convention presenter. In addition to motivating delegates, he teaches people how to harness the power of positive thought to succeed in both their personal and professional lives.